A shock winner at the first major TCT regular season event. As expected with a Worlds year, we saw some big roster moves in the offseason for the mixed division as top teams try to consolidate talent to make a run at a WUCC bid. This past weekend, we got the first look into how those rosters stack up at the Pro-Elite Challenge, as the Triple Crown Tour regular season got fully underway. So, where do we stand after the first test of the club season? Unlike the relative predictability of the women’s and men’s divisions, mixed always manages to keep us on our toes. Although it was clear that many teams are still working in new players and fine-tuning their systems, the tournament was a great showcase of the excitement and action of the mixed division. The upsets started early in pool play on a sweltering Saturday at the Aurora Sports Park and keep coming all the way through Sunday’s final. Pool A saw perhaps the biggest surprise of Saturday. After starting their weekend strong by easily handling Denver Love Tractor 13-9, top-seed Boston Slow White fell flat against Florida’s G-Unit in their second game of the tournament. Gainesville came out hot, using monster pulls to pin Slow White’s offense deep in their own endzone and earning some early short-field break opportunities. Brawley Adams had a big game for G-Unit, leading his squad to a 7-6 halftime lead over the defending national champs. With Boston’s energy low, one break out of halftime was enough for G-Unit to pull away for the upset with a final score of 12-10. Meanwhile, the hometown team Denver Love Tractor was able to upset pool two-seed Ambiguous Grey 11-8. After two rounds, all teams in the pool sat at 1-1, setting up a pressure-filled final round where any team could earn a bye to quarters — or be knocked out of the tournament entirely. As you might expect from an experienced top seed, the squad from Boston was able to regroup and refocus and put Washington, DC Ambiguous Grey away fairly easily (10-6). One field over, Love Tractor knocked off a G-Unit squad (12-6) that was looking rundown after the close game against Slow White. With the win, Denver earned the second spot in the pool while Gainesville was dumped to the consolation bracket despite their big upset. Those who were paying attention last season may not have been overly surprised to see the Pool B results. Fort Collins shame. shocked many fans by winning the South Central region in 2016, but after their debut on the Nationals stage — including a fantastic game against Mixtape that was streamed on Ultiworld — shame. wasn’t going to be able to hang under the radar this weekend. While they came into the tournament at the bottom of their pool, Fort Collins notched convincing wins over Madison NOISE (13-8) and Pittsburgh Alloy (13-10), falling only to top seed Drag’n Thrust (13-6) in pool play. Shame. still seems to live and die by the huck, but what they lack in strategic nuance, they make up for in their throwing arsenal and athleticism. The team has more depth in personnel and skill this year than they did last year, picking up Tina McDowell and Ashley Daly Morgan from Molly Brown. Their women are big and fast and played a huge role in their two Saturday wins. Despite missing one of their big play makers this weekend — Nick Snuszka, who appeared sidelined with a knee injury — shame. are currently looking like the strongest team in the South Central. Minneapolis Drag’n Thrust started their day strong and looked untouchable in their first two outings against Alloy (13-6) and shame. At their best, their vert stack was looking smooth, they connected in the deep game, and they played physical person defense — all familiar characteristics of the three-time national champs. However, Minneapolis showed cracks in their system down the stretch on Saturday, losing on double game point to regional rival NOISE in the last round. Even with the big win, Madison unluckily sunk to third in the pool, as three teams finished 2-1. Like their Pool A counterparts, top-seed Drag’n earned a prequarters bye despite picking up a loss, while Fort Collins slotted in at the second spot ahead of NOISE. In a much more straightforward, but still not-to-seed finish, second-seeded San Francisco Blackbird, put away the competition in Pool C and finished Saturday 3-0. In order to avoid prequarters, Blackbird went through Cincinnati Steamboat (13-11), Minnesota No Touching (13-10) and Iowa’s Chad Larson Experience (10-9). San Francisco looked strong behind the on-field play of Mac Taylor and off-field leadership from new coach, Bhavin Parikh. Given the number of new players on the Blackbird roster, they showed good chemistry and cohesion. Steamboat looked to be the clear second team in the pool, beating out No Touching (13-9) and Chad Larson Experience (13-7), to secure their spot in prequarters. There they beat a third North Central squad in NOISE, to advance to Sunday’s championship bracket. Longtime division stalwart Chad Larsen Experience is looking to get back on track after missing Nationals for the first time in program history in 2016. The Iowans were hard-luck losers in two double game point matches during Saturday’s pool play, leaving them on the outside looking in for the championship bracket. They recovered on Sunday to top the 13th place round robin, winning three games through the efforts of the ageless Kevin Seiler. Coming into the weekend, many expected that Dallas Public Enemy — with the addition of 2016 Offensive Player of the Year Chris Mazur — had a chance to take a big step forward and make a deep run at PEC. But those hopes were quickly dashed in pool play. In the first game of the day, Public Enemy was loose with the disc, making poor decisions and simple execution errors that an efficient Philadelphia AMP happily punished them for. The same storyline would play out all day, as Public Enemy went 0-3, missing out on the championship bracket and the opportunity to even hold seed. While it was a disappointing display of early-season miscues for Dallas, their struggles may have been equally a result of the quality of the other teams in the pool — three of which would go on to earn spots in the semifinals. Perennial national title contender Seattle Mixtape finished pool play undefeated, earning a three point victory over crosstown foes BFG and a blowout win against Dallas before sneaking by Philadelphia AMP on double game point. AMP was similarly efficient in dispatching Seattle’s second team and Public Enemy before Mixtape handed them their sole Saturday loss. Philadelphia made easy work of Ambiguous Grey in their prequarter late in the afternoon to stay alive heading into Sunday. Entering the tournament as the bottom seed, the lesser known Seattle mixed team, BFG, went 1-2 in Saturday’s pool play, beating a reeling Public Enemy 13-11 in the last round. After succumbing rather easily to the juggernauts at the top end of the pool, BFG had quietly secured a spot in the championship bracket without looking overly threatening — yet. With the pool winners gone from the fields after earning their byes, Seattle knocked off last season’s PEC champion, Love Tractor, to start what became an incredible bracket run. Overall top-seed Slow White faced shame. in the quarterfinals on Sunday morning. The national champs’ depth of talent on both sides of the disc overpowered shame. and helped propel them to a confident 13-6 win. Boston was able to slow the deep game that shame. heavily relies on by poaching the lanes and throwing some straight-up marks. While Fort Collins had been able to lean on their women in pool play, Slow White’s ladies were able to contain their speed and remained consistent offensive threats, running the shame. women ragged. Second Team All-Club selection Jake Juszak was impressive for shame. in the quarterfinal, standing out both as a thrower and receiver, even in the loss. Shame. certainly flashed the potential to remain a threat this season but will have to find ways to win late in tournaments if they want to break into the top echelon of the division. Similarly, Steamboat was outmatched by Mixtape’s talent and flashy playing style. Cincinnati’s traditional zone was impotent in the windless conditions, as Seattle’s skilled throwers picked the Steamboat defense apart. Mixtape took a commanding lead going into halftime and the Ohioans were never able to get back into it. Seattle is clearly a top team this season and showed their depth in this game, cycling in their entire squad throughout the second half and getting contributions from up and down the roster. In the most exciting game of the quarterfinal round, Blackbird and AMP traded points nearly the entire game en route to a double game point thriller. AMP ran their offense through their strong female roster, often putting four women on the line for O-line. Several times over the course of the game, Blackbird was able to come up with big plays when Philadelphia threatened to pull ahead. At one point, Blackbird launched a huck deep that was well covered by AMP defender Matt Zumbrum. Zumbrum was able to get a hand on the disc, but macked it into the hands of the Blackbird receiver who held on for the score — a clearly deflating moment for a typically unflappable Philly squad. Ben Pelleg and Raha Mozaffari were linchpins for AMP throughout the game, steadying their team and igniting their offense. After a grueling double game point with multiple turnovers from each side, AMP was able to knock off Blackbird and secure their spot in the semifinals. Not as exciting as a double game point finish, but in the most surprising result of the quarters, Seattle BFG took control and kept their energy high, securing the upset against powerhouse Drag’n Thrust. BFG captains Alexa Kirkland and Lili Gu said after the game that the team was focused on what was within their control. The game plan ended up being enough to tee up a semifinal against AMP — a rematch from pool play. On Saturday, AMP didn’t have much of a problem putting away BFG 12-7. This game was a much different story. BFG struck early with a break on the first point. The teams traded a few before a very long, multiple-turn point that Seattle would eventually win (after a well-timed timeout) for another break, putting them up 4-2. AMP was able to earn one of the breaks back late in the first half but BFG took half 7-6 and up a break. Out of the half, AMP tried to slow the BFG offense with a straight-up mark and some force middle defense but they were not able to disrupt Seattle’s fluid, quick disc movement. BFG mixed up their offense between ho, split, and side stacks and easily moved the disc downfield. Their receivers, CB Wolf, Cody Rebholz, and captain Alexa Kirkland had great chemistry with their throwers and were impressively consistent. The teams traded points throughout the second half meaning BFG’s break on the first point ended up being enough to hang on for the win. On the other side of the bracket, the semifinal between Mixtape and Slow White was a game of runs. Boston opened the game with a couple of quick breaks early in the first half. After a strategic time out, Mixtape was able to go on a little run of their own to tie it up 6-6 and then break to go into half up one. Mark Burton showed his importance on offense for Seattle along with Abbie Abromovich, who had an impressive game against Slow White’s strong female defenders. Brad Houser continued his big weekend as a consistent presence on the Mixtape D line, disrupting a number of plays for the Boston O. In the second half, Slow White’s women ignited their defense — Mia Bladin and Olivia Hampton got a couple of monster layouts, which sparked the entire squad. Jeff Smith and Lexi Zalk were huge contributors as usual, as Boston tied it up late in the game as the cap horn sounded. The game would go to double game point and came down to a critical foul call as Khalif El-Salaam tried to get off an around reset by throwing through Tannor Johnson’s stationary mark. The observer overruled the foul call, giving Slow White the disc. Johnson busted deep and was able to haul in the goal over El Salaam to secure the win for Boston. After the game, Slow White captain Alex Trahey said that the keys to winning were shutting down the Mixtape’s deep game early on D and knowing their strengths. In an unlikely final matchup, #1 Slow White faced off against #16 BFG for the tournament title. After a series of straightforward holds from both sides, a huge layout D from BFG when the game was tied 3-3 ignited the first break for the underdog. The BFG D-line (or “BFD”) was able to generate a couple more breaks by relying on their strong person defense to force errors out of Slow White’s O-line, which was starting to look gassed after their tough semifinal battle against BFG’s crosstown rivals. 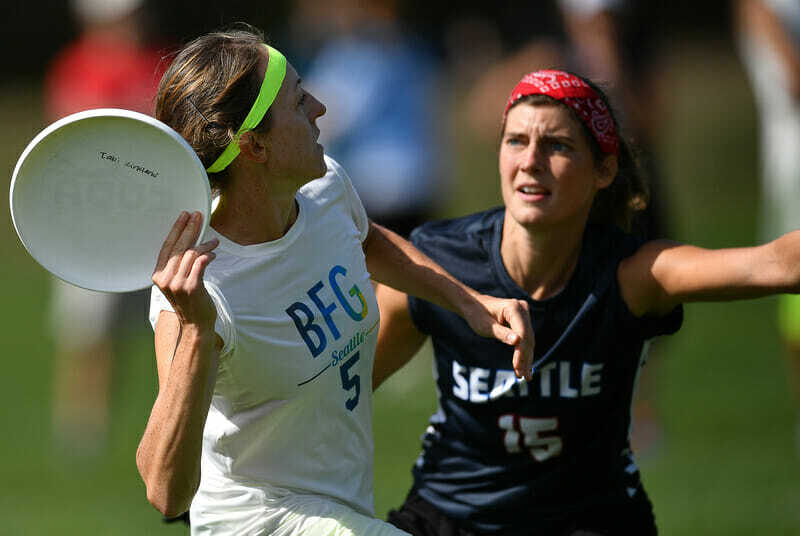 On the other side of the disc, Seattle was disciplined and patient — they rarely forced throws, executed at a high level, and worked the disc around, waiting for opportunities to present themselves. BFG earned a couple of really impressive layout Ds in the first half that they were able to convert to breaks, taking half up 7-6. Seattle received out of the break and were able to hold for a score through a multiple turn point. BFG were able to snag another break off of an inspired block to go up 10-7, before trading points through the end of the second half. Slow White showed signs of fatigue and had trouble stopping the quick disc movement and energy from BFG, but continued battling. The final point of the game was emblematic of the game as a whole. Slow White received the pull and looked good moving the disc up the field before turfing a throw outside of the BFG end zone on a tired execution error. Seattle patiently worked this disc laterally across the field multiple times and eventually called a timeout to queue up a set play. Slow White was able to foil the BFG plan out of the timeout and got the disc back with a smart poach block on a reset. Unfortunately for Boston, their offense was not able to capitalize, a miscommunication quickly turning the disc back over to a BFG player who launched a wide-open hammer to the endzone to lock in the win for the #16 seed. BFG’s performance on Sunday was a testament to the importance of efficiency on offense and sideline energy. That’s not to say that BFG didn’t have flashy moments, however their success in Aurora was largely due to their strong team chemistry and ability to execute fundamental ultimate patiently and consistently. Unfortunately, the same could not have been said of Slow White in the final, who seemed a bit out of sync with each other and exhausted down the stretch. They missed quite a few huck connections and had some bad turnovers on throwing and catching execution. Trying to put their tournament victory into words, the BFG captains said that the team “just felt lucky” to be able to compete on this stage together as a team. They’re excited to ride this momentum and continue to play hard and have fun all season. The team will next be competing at the Elite-Select Challenge in Appleton, WI in August and then at the Pro-Flight Finale, which will be on their home turf outside of Seattle in early September. They’re hoping to earn another Nationals bid for the Northwest Region, who only had one bid in 2016. Comments on "Pro-Elite Challenge 2017: Tournament Recap (Mixed)"